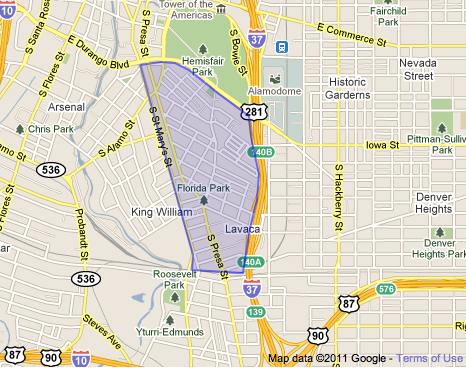 The Lavaca neighborhood is the oldest existing neighborhood in San Antonio. It is bounded on the north by César E. Chávez Boulevard, on the south by the Missouri-Kansas Railroad Line, on the east by IH-37, and on the west by South St. Mary’s Street. Part of the neighborhood is a Historic District. You can see a map of that area on the right, and you can read more about it here. Historically, Lavaca was a neighborhood of artisans, shop owners, and laborers. Today, the neighborhood remains incredibly diverse and is the home to small business owners, artists, software developers, chefs, architects, lawyers, laborers, corporate executives, singles, young families and the active retired. Many people who live in the neighborhood were born here. Many others have moved here from the suburbs, from Austin, and from places as diverse as New York, Wisconsin, and Northern California. Residents love the neighborhood because it is welcoming, diverse, walkable, and active. As a downtown neighborhood, Lavaca offers easy access to cultural and social activities, to restaurants, art galleries, brew pubs, and city celebrations. As a real neighborhood, Lavaca offers a community of friends and neighbors. There’s plenty going on within easy walking distance of Lavaca. Many city events center on HemisFair Park, La Villita, the Riverwalk, or the Arneson amphitheater — all just minutes away by foot. At the same time, there’s plenty going on in the neighborhood itself. There’s a weekly Happy Hour get-together that has given many new arrivals their first and fastest introduction to neighbors. We have a Block Party in October. There’s a neighborhood Potluck dinner in January. We’ve held neighborhood “Crawls” — a get-together that’s hosted by multiple neighbors and moves from house to house — as well as art shows at the homes of neighbors. In fact, there’s so much going on in Lavaca and nearby, that one of our neighbors produces a weekly email newsletter, just to keep everyone up to date. You can see a sample here and you can sign up to receive it here. It comes out every Wednesday morning. For neighborhood “business”, there’s an email newsletter from the Lavaca Neighborhood Association. That newsletter will keep you up to date on things like the City’s HemisFair Park redevelopment plans and the San Antonio Housing Authority’s plans for Victoria Commons. That newsletter comes out once a month. You can see a sample here and sign up here. If you live in the neighborhood, you can also join our private Lavaca social network, Nextdoor Lavaca, where neighbors keep in touch online. 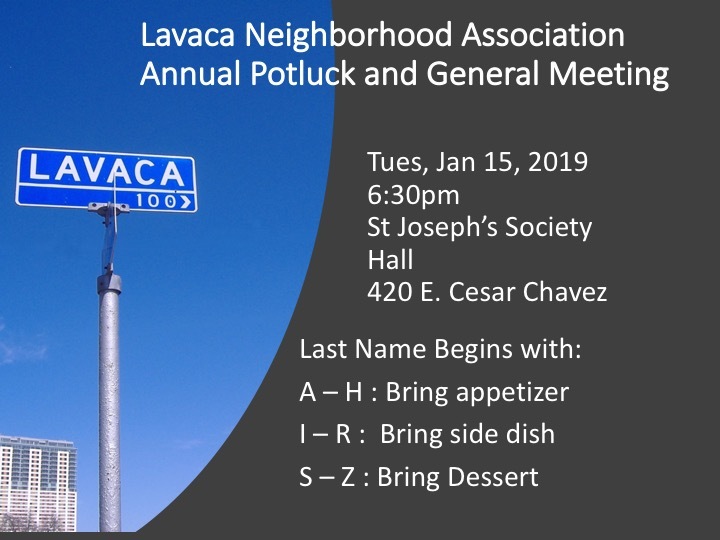 Lavaca has a very active neighborhood association that focuses neighborhood attention on important issues and serves as a conduit for the neighborhood to City agencies. The association also sponsors several events during the year, including, for example, a Candidates Forum in 2011 that gave neighbors a chance to personally meet and question all the candidates for the City’s District 1 council position. Questions? Contact us at president@lavaca.net. You can join the association at any time. Here’s information on becoming a member.